I stopped wearing perfumes a long time ago. While I wore them with abandon when I was younger, I find I have developed a sensitivity to scents and chemicals. They make my eyes itchy and sometimes I even feel dizzy around too much scent (like in the aisle of cleaning products at the grocery store). When I became pregnant with my son over 11 years ago, I didn't want to expose him to toxic scents, so I gave up perfumes entirely. That is, until recently, when I received a lovely package in the mail from Grasse Roots Perfumery. Grasse Roots perfume oils are vegan and created with 100% natural essences and fine perfumery botanicals. They are made from rare and precious substances derived from flowers, leaves, roots, grasses, barks, mosses, resins, woods, seeds and earth. Certified organic essences are used when possible. The first perfume oil I tried was Delicacy, because the name sounded appropriate for my reintroduction to perfumes. The 5 ML bottles have a convenient roll-on top, which prevents you from spraying on too much perfume. Don't you hate it when people overwhelm your personal space with their scent? I confess I found it odd to be wearing a scent after so much time, but I grew to enjoy the gentle, reassuring scent of Delicacy over time. It's a lovely perfume and I don't think I can do it justice with my description, so here's the official description. "A soft, mellow chypre with subtle notes of moss, rich, ambrosial rockrose and patchouli; sandalwood is featured, lifted with sweet geranium petals and notes of tea and conifer." Doesn't it sound delicious? Next up was Geisha, which is a little bit bolder and spicier, as the name suggests. "Narcotic flowers of jasmine, ylang ylang, seductive neroli and dusky rose swirl through sensual notes of earth, wood and spice in this exotic, heady oriental." Geisha is truly beautiful too and neither of the perfumes bothered my eyes or my skin in any way. I also tried Sleep Balm Solid Perfume, which is scented with lavender, bergamot, chamomile and marjoram to soothe and relax you. It has a pleasant, light, uplifting scent. It is made with solid beeswax, so it's not entirely vegan. The label suggests applying it to the ends of your hair, cleavage and pulse points. I love the idea of having a gentle scent waft through the air as you toss your hair! And the solid perfume format makes this perfect for tucking in your purse to pamper yourself with throughout the day. 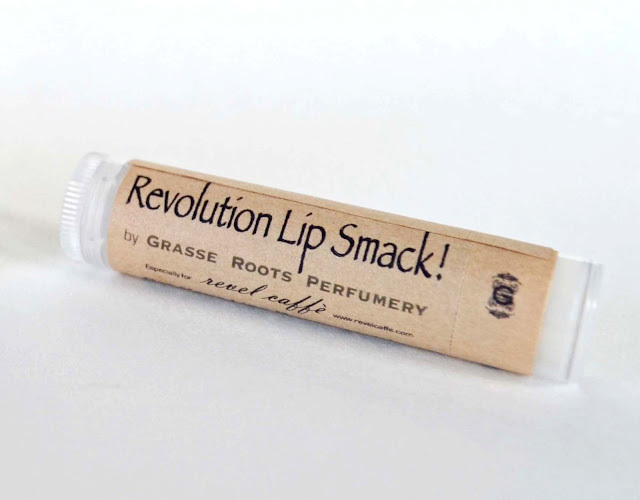 Coffee lovers (and those who just love the smell of coffee) will enjoy Revolution Lip Smack, a lip balm (containing beeswax) made with Revolution Blend fair trade coffee beans from Revel Caffe in Stratford, Ontario. This delicious balm contains entirely natural and organic ingredients, including essential oils of vanilla and cocoa. It has a nice, moist consistency and it tastes delicious! The woman behind Grasse Roots, Claire Lautier, has family roots in the South of France, quite close to Grasse, the centre of the perfume world from the 19th Century to today. 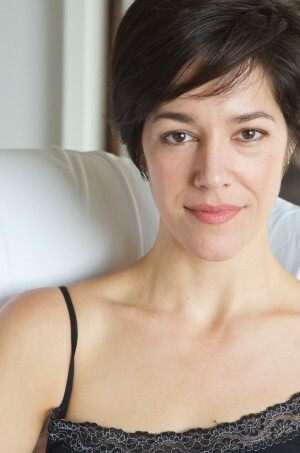 Claire, a classically trained actor of stage and screen, says she developed "an emotional library of natural scent associations" when she spent her summers in the South of France growing up. Anybody else jealous? What motivated you to start Grasse Roots? I have found, since this all began, that the true purpose of Grasse Roots Perfumery is to empower women all over the world with the knowledge that our true beauty, true power and the true nature of womanhood itself (you could call it our Goddess Nature) is to be found in a dynamic connection with our spirituality. When we're connected to the truth of who we are, we can fulfill our soul's purpose and fill the world with light. And the world very much needs women to connect with our true nature and with each other at this time. What is the relationship of scent to spiritual beauty? For me, beauty is not just another layer of artifice, covering ourselves up in the hope of appearing somehow 'better' (more desirable, more successful, fill in the blank, ladies!). Rather, Beauty is a revelation, an unfolding, peeling away layers and simplifying, until we arrive at our essence, which is infinitely beautiful, powerful and has the capacity to heal on a vast scale; this is our gift to the world. Natural perfume speaks to that desire in women. Enter to Win Grasse Roots Perfumes! One lucky Woman in Real Life reader will win a sample set of Grasse Roots liquid perfumes (seven in all, in a black velvet bag). This retails for $32. You are sure to fall in love with one (or all) of them! Claire is also providing the winner with a Revolution Lip Smack. Enter to win using the rafflecopter widget below. Contest is open to residents of North America. *I was provided with products for review purposes. The opinions are my own. I love roll on perfume - count me in!! Thanks for offering the draw! the Revolution Lip Smack sounds amazing!! i would love to win!! It is popular! I'm not a coffee drinker (anymore, sadly), so this is how I cheat! Good luck Stephanie! I would love to try the Blood Orange perfume! Great giveaway!The sleep balm looks very interesting, cool products! Good luck, Natalie, and thanks for your feedback! Geisha has many fans -- and it smells so different from person to person, it's like everyone has their own Geisha! Oooh that tuberose musk sounds wondrous!! Great giveaway! Good luck! The musk part of Tuberose Musk comes from ambrette seed -- a vegetable musk that also has a wonderful sweet, nutty quality, which complements the bold notes of the perfume. There's no need for synthetic musk when we have such a wonderful vegetable alternative! I love my baths so I'd love to try the Conifer bath salts. Hi Jennifer! Pretty soon I'll be offering a trial size of all three of my bath salts together, in addition to the larger regular sizes. Keep checking in at www.grasseroots.com in the coming weeks! The Delicacy perfume oil sounds lovely! I love the essential oil combination they put together, the packaging is quite beautiful too! Thanks Christine! Many people who have shied away from perfume for a while like to begin with Delicacy. It's gentle and subtle, and if you like sandalwood, it's a great choice! The Vitality bath salts looks awesome. I love to soak in patchouli. It seems to be both relaxing and invigorating! 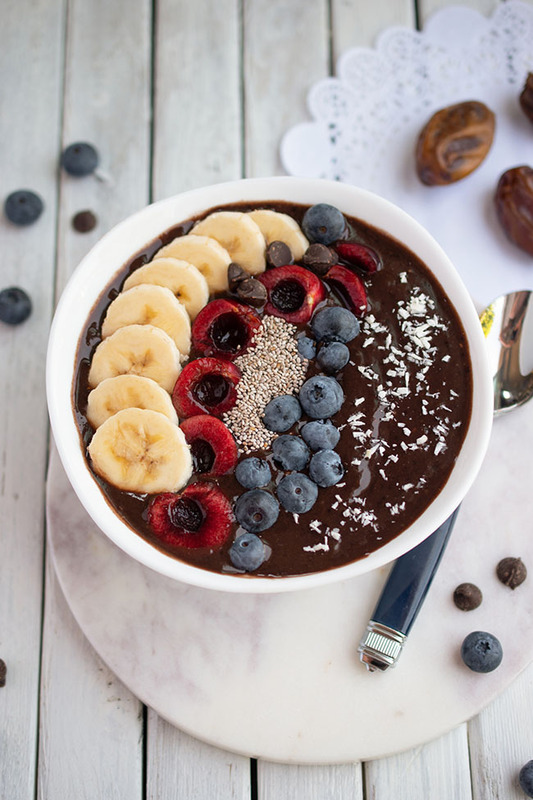 So happy that I found your bloggity blog via Vegan Perks. It's so pretty and sassy. Love it! And these perfumes look CRAZY GORGEOUS! I know someone who accidentally put hers through the laundry -- twice! She said it survived and she's still using it! It's got some pretty decent staying power. And all natural, of course! Ohh tuberose musk perfume sounds amazing! I am fascinated by the sounds of this Geisha perfume oil. I like the idea of a perfume oil, as well, it seems like it would last longer without being overpowering. Thank you for offering the giveaway! It's my pleasure! Yes, many people like the oil based perfumes. There's a special sensuality to applying an oil, too. i'd like to try the Conifer Bath Salts. Thanks! It truly is like having a soak in the middle of the woods! You're welcome, Jenn. Good luck! The Revolution Lip Smack sounds great! Ho. hard choice. I would like to try them all. Because i have to make a choice it would be the lip smack. I would love to try the Bathing Beauty bath salts....just need to find a time I could relax and enjoy them with my baby boy. 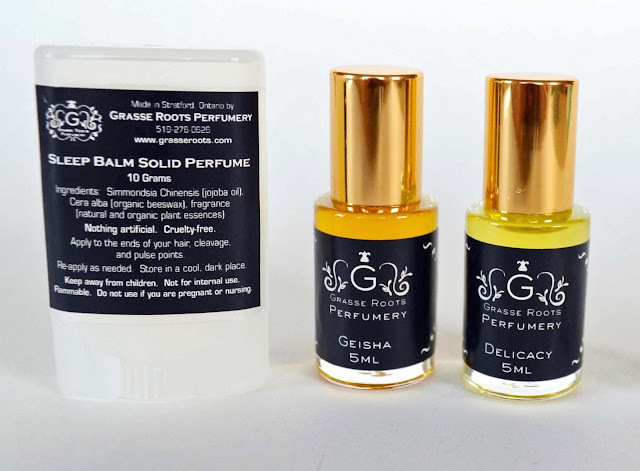 Love your packaging and your blog is great.Geisha is a perfume I would like to try. What a generous gift pack- hope I'm a winner! Have a good day. I most want to try beloved! Beloved would suit you, Jillian Rose, as it's all about roses! Great giveaway! Hope I win to get to try your products. Thanks, Lisa Marie! I know, I wish we could smell through the computer too! That's why I offer sample sizes for sale on the website; pretty soon every product will be available in a sample size. Blood Orange sounds intriguing! love the concept and would like to try them! 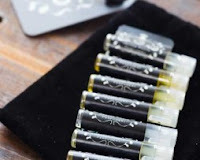 I would like to try the Perfume Oils Sample Set. I would love to try Vanilla Orchid Room Spray. I have a new batch of genuine vanilla bean tincture in my studio right now. I soak the vanilla beans in the natural grain alcohol for 6 weeks before I make the room spray! Very relaxing... some people rub a little on the temples and under the nose before bed. i am a fragrance junkie...and cannot wait to try this line! This is perfect for me . . . I've been on the hunt for a nice scent for my wedding! Good luck, Kirsten! And best wishes! Wow! This looks like an amazing line. Love that it's organic and cruelty free. Forgot to add that I'd love to try the sleep balm. I really love balms. I think I would like the beloved scent and the room spray-thanks! I would love to try the Sleep Bailm solid perfume! I do love a nice light smell something that gives you your own.Maybe this could be it I would love to try hope I win. Since I can only imagine the wonderful scents available, I would choose the trio of solid perfumes. That way, I could try them all! These products make me want to wear fragrance again! I've been reluctant to use my old perfumes since learning that the ingredients in them aren't good for me. You know, Julie, I hadn't worn perfume for years because I just wasn't attracted to the department store fragrances. When I was a child I was given some wonderful old classic French perfumes by my grandmother and I loved those. There's great joy in wearing things that smell like nature -- I wear scent every day now (of course!) and find it very healing. I'd like to try out the Vanilla Orchid Room Spray in my home. Definitely the sample set of fragrances! I travel weekly for work, so having the ability to carry-on a bag (meaning fit ALLLL my toiletries into a small bag) is essential. Plus I love variety and mixing up fragrances! The sample set is definitely for you, Kristi! I also sell travel sizes (5 ml) of all the fragrances, and they're terrific for popping into your bag. I would most like to try the sleep balm. Thank you for the draw! The vitality bath salts for me. Sounds like some amazing products! I want to try all of them. Really. Hmm. You've just given me an idea. How about a 'try the whole line' sample set? Do you think people would like that? The vitality sea salts seem very interesting! I'd like to try the Geisha perfume. Excited to have found another canadian blogger! I would like to try the Bathing Beauty. thank you for the great contest. It seems to me I would love at least 1 of everything she sells. LOL! what great products. but I think the best one for me is the sleep balm solid perfume. I have horrible insomnia and this sounds like it would be very relaxing. I would get it in the set of 3 because the other 2 sound so yummy I can't pass them up. Tammy, very soon you'll be able to buy sample sizes of the solids to try out too. I'll sell them as a little set of three. Stay tuned! The blood orange sounds like it would smell lovely. I'd love to try the Tuberose Musk perfume oil! I would especially love to try the "Delicacy" scent. These look delightful! Beloved is the one for me. I think. Hope I get to smell them all! I would love to try the Sleep Balm. The ingredients sound heavenly! They all look so good that I want to try them all! If I had to try only one, though, I would have to say the Vanilla Orchid Room Spray. I'd love to try the sleep balm solid perfume! I'd like to try the Vanilla Orchid Room Spray. I'd like to try the Blossom Solid Perfume! It would be a lovely surprise for my lady. Hmmmm.......everything! Blood orange perfume oil. Vanilla Orchid room spray. And sleep balm:) thank you! Everything sounds so great, but the Vanilla Orchid Room Spray sounds really good! Would love to try Blood Orange! Oooh!! The Tuberose Musk for me please!! Thank you so much! I'd like to try the one called Blossom. Mmmm. . .Delicacy sounds divine! I love lavender, chamomile and any subtle floral scents. The roll ons and solids would be great to pop in to my purse or when travelling. That coffee balm sounds great!! I think I'm gonna have to go buy me some pronto. I'd love to try their Lip Balm. I've been looking for more natural lip balms lately. I always use lip balm, I wonder if coffee lip balm would keep me awake. I would love to try the perfumed oil sample set. I would love to try the blossom solid perfume, I've never used solid perfume before. Everything looks great! I want to try it all! The sleep balm looks cool! I would like to try the blossom perfume. I want to try Sleep Balm. I want to try the sleep balm and lip balms! ALL the fragrances sound lovely, but I would love to try Geisha! Thanks for the chance to win! I would love to try sleep balm, I have issues sleeping. trio of solids.. looks fantastic!!! they all look like great products! I would love to try the Gourmandise solid perfume. I've gotta try Janus it sounds like a scent I could share with my husband. Ingenue sounds nice as well I'm a sucker for ylang ylang. Solid Perfume Sample Set- a little bit of everything! I would love to try the Blood Orange perfume! The fact that it's not a spray is such a bonus!!! Geisha sounds amazing! So does the sleep balm. I'd like to try the Blood Orange Perfume Oil. I love Citrus Scents. I'd like to try the Blossom Solid Perfume. The sleep balm would be amazing to try. Your blog is a great one. Hi! I'm Joann, a Toronto, Canada freelance writer and mother of two kids and two beagle-mix rescue pups. Inspiration is all around us, but how often do we miss it as we speed through our days crossing things off our lists? 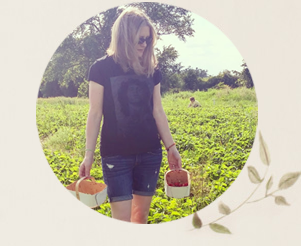 Grab a cup of tea and join me in exploring the art in everyday life, including diy, decor, books and lots of easy-to-make, family-friendly vegan food. Visit Woman in Real Life's profile on Pinterest.